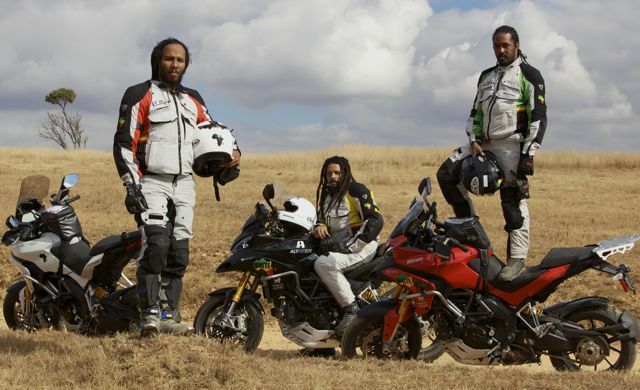 These are the words of Ziggy Marley, eldest son of reggae superstar Bob Marley and heir to one of the most legendary families in music, on the historic motorcycle trip he took to Africa with his brothers, Rohan and Robbie, during World Cup 2010: the first-ever World Cup to be held in Africa. Camping under the stars and staying with local families kept the team close to Africa’s people, land, and wildlife, and their REV’IT! GORE-TEX® Defender GTX jackets and trousers kept the Marley brothers well equipped for all the twists and turns of their trip. Capturing all of the action was award-winning producer/director David Alexanian and his production crew from Elixir Films, for a series called Marley Africa Road Trip. Alexanian is known for filming Ewan McGregor’s unforgettable motorcycle trips across the world, in the series Long Way Round and Long Way Down, and he has created a wonderful record of the Marleys’ trip and its meaning to them, in part through personal interviews and tour diaries.